This is the context in which Mrs Bianca Schulz, Head of the European Consumer Centre France, agreed to this interview. We should also point out that in the spring of 2016 the ECC referred a case to the Mediator concerning a German consumer having a house in France, who had experienced difficulties taking out a contract with ENGIE. Bianca Schulz: “The European Consumer Centre (ECC) France was set up in 2005 and is jointly funded by the European Commission and the French State. The ECC France is part of the network of European Consumer Centres (ECC-Net), whose main mission is to inform consumers of their rights in Europe and provide them with free legal aid In the event of a dispute with a professional based in another EU country, in Iceland or in Norway. There is an ECC in each country of the European Union, as well as in Iceland and Norway, making a total of 30 ECCs in the network. The special feature of ECC France is that it is based at Kehl in Germany, at the border with Strasbourg, in the same premises as ECC Germany. Both ECCs (France and Germany) are part of the Franco-German association called “European Consumer Centre”, which is thus the only bi-national centre in the network of European Consumer Centres”. Bianca Schulz: “ECC France works actively with the French consumer organizations. 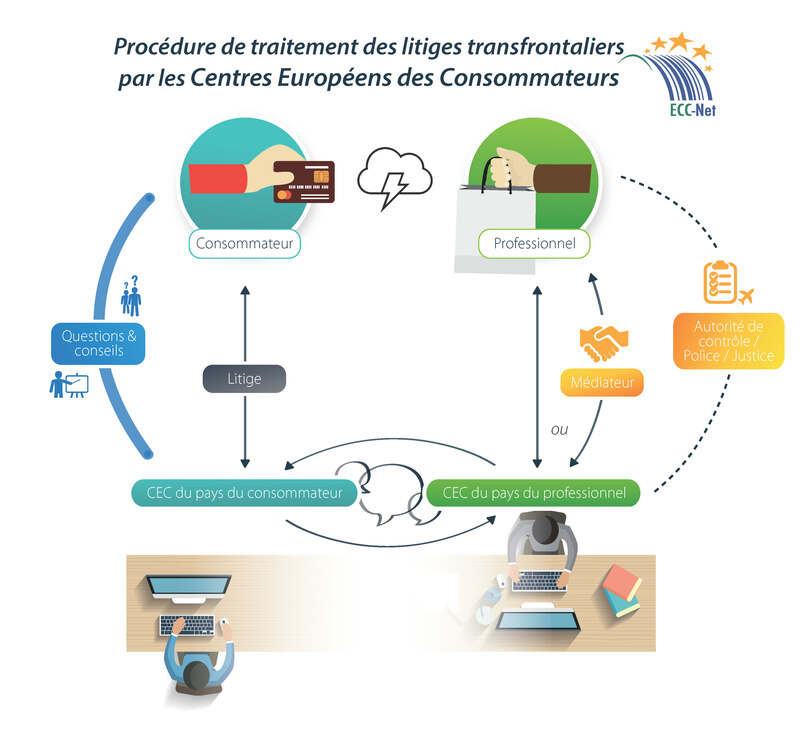 In addition to exchanges of information (through the Institut National de la Consommation – INC – in particular), ECC France receives many cross-border complaints from consumer organizations. While the national association is still the consumer’s point of contact In the event of a dispute, ECC France informs the association of all the procedures and results to try and resolve the dispute out of court. ECC France is also regularly referred to by national associations to come and train voluntary workers in the treatment of cross-border disputes. Concerning BEUC, ECC France regularly exchanges a lot of information, statements of position, studies… with this organization”. After checking that the complaint is admissible (cross-border dispute in a consumer area we deal with), and where applicable translating the supporting documents into English, we pass on the French consumer’s case to our colleagues in the ECC where the professional is based. The ECC of the professional’s country then contacts the professional to assert the consumer’s rights and find an amicable solution to the dispute. Both ECCs (the consumer’s and the professional’s) communicate via an extranet, and ECC France informs the French consumer of all the procedures undertaken and the solutions proposed. Nearly 75% of cases are resolved out of court”. The diagram below also summarizes this procedure. Bianca Schulz: “It is still too soon to take stock of the implementation of the ADR Directive. Indeed, not all the countries have introduced it yet, and some consumer areas are not yet covered by it. To settle protracted disputes and serve the collective interests of consumers, we also work in close collaboration with the DGCCRF (General Directorate for Competition Policy, Consumer Affairs and Fraud Control)/the CPC network in France”. Jean Pierre Hervé: “Thank you again Mrs Schulz, Head of the European Consumer Centre France, for all this information, which I am sure will help French consumers visiting my web site better understand the benefits of your organization for the resolution of cross-border disputes in Europe. “.